Hi everyone! It's that time again where Kristen and I ask the question "so...what's new with you?" 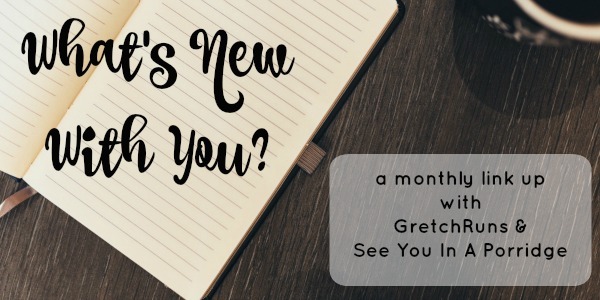 I absolutely love reading your life updates and seeing whats new each month, so be sure to link up! Remember- the rules are simple..just add any recent post (life updates are preferred so we can keep up with your life!) and just link back to your hosts. We also recommend checking out the other people who link up! That's it :) Have fun! Last month, Dan and I took a trip to Belize to get married. I was being really sneaky because I was actually there during the last WNWY linkup, but didn't want to say anything! The trip was absolutely amazing, and married life is great so far! I've shared a few posts on the trip so far (with a few more coming up). You can see pictures from the ceremony here, read about San Pedro here, and look at the creepy caves we visited here! We're all moved in to our house! On Monday, we went to our apartment and got the last of our stuff out and cleaned out the place. We are officially moved into our house! I absolutely love it so far- the neighbors are really friendly and welcoming, the neighborhood is quiet and family-friendly, the bus route is convenient, and there's so many cool restaurants and stores within a few miles. It might be dangerous for me once my no-buy is over, but I'm kind of excited too. Quick story time- I started working for my company right out of college (I was actually offered a full time position during my internship before senior year) and was in the same department for three and a half years. I got really close with my coworkers, but never really felt excited by the work or challenged. This is actually the reason why I started my blog last year- I was feeling empty from my job and needed something creative to do in my life. Last September, I talked about going to a career fair to recruit for work. There was another recruiter there from a different department at my company who I started talking to, and found out that he had my dream job. Ever since then, I've been pursuing this position and going through tons of interviews. Right before we left for Belize, I was offered a position, and started the week after we got back! So far, I'm absolutely loving the position. I work in digital technology now, and my group is responsible for everything mobile related. I get to design new content for our applications, research new technologies, make presentations and recommendations to executives, and more. Every day is different, and I'm excited to go to work every day now. It's kind of amazing! I'm about to start half marathon training! Ok- your turn. What's new with you? Wait.... you got married? WHEN jk. Yeah, let's just say that May was YOUR month! Thank you! I'm excited to talk about running again!! Wow, I'd say May was a BIG month for you!! New job/house/wedding?? Shoot, it's all downhill from here! Except that now you'll be off no-buy so there's always shopping to console you! LOL. Eek! Don't say that haha! Sounds like an amazing month that will be hard to top! Congrats on the marriage, move, and promotion! A lot of my friends work at PNC so I wonder if you work with any of them (or did work with any of them!) Glad you are feeling challenged again- PS I started my blog from being bored at work too, haha. That would be so cool if I knew some of them! It seems like half of Pittsburgh works at PNC haha! yayyy congrats on getting married again lol. that's great that married life is good so far :) and yay for everything being fabulous about the house. when does your no buy end again? buying house stuff is fun! excited for your half marathon, my next one isn't until october, plenty of time to train! and big congrats on the new job of course! Your job sounds awesome! I definitely want to hear more about it the next time we see each other. Congrats on officially moving to your new house! So many exciting changes--this is shaping up to be quite a year for you! Also, thanks for hosting the linkup! Thanks for joining us! And I will gladly talk alllllll about work haha! So many awesome changes for you recently! Congratulations on getting married-- what a gorgeous location, and congrats on your new job and moving too! Oh yay! I'm happy for you that your life has had so many positive changes in it recently! You've had a lot to celebrate. Wow!! I'm really excited about your half marathon training! Thanks Suzy! I'm excited too! May was such an exciting month for you! Congrats on your marriage, new place, and dream job. It does feel like a few years after college is when everything really falls into place. I'm super excited about your half marathon training also! You know I love the half distance - the training for it is so fun! Definitely agree with that! There's so much change in the first 5 years and hopefully everything settles after that. DANG lady! Marriage, a new home, AND a new job in one month? You are on fire! Congratulations on all of those, especially the new job which I am just now learning about. I'm glad you found something that is more fulfilling for you. Yay happy times!! What an AMAZING month you had! I love it. Congratulations on ALL THE THINGS in your life. WOW!!!! Congrats on the wedding, new house and new job!!! Quite an exciting month for you!!!! So much awesome for you in May!! Seriously, what a huge month, acquired a husband, a new job & a house. Congrats! And excited to hear what half you're training for! Oh my goodness what a month!! Congrats on the marriage and getting moved in to your house. And congrats on the job!!! Sounds like a wonderful position! That is one of the reasons I have a blog, to fulfill the creative void from my job. Best wishes on the half marathon training! Wow what a great month! Congrats on your marriage and the house! How exciting!! I feel like I can really relate to your new job story, I just went through almost the same thing! I started a new job in May (but at a new company) making the transition out of the position I was in since I graduated 2 years ago. I was also offered the position while finishing up my internship for them. And like you, I loved my team and wasn't challenged which is part of the reason I started blogging. Yay for new opportunities! Wow, just like my situation :) Thank goodness for blogging right? Wow, such an amazing month! Congratulations on getting married and on the new job! I moved to a new department at work after spending about 2.5 years in the original department I was hired into. I was in a very similar situation: I loved my coworkers, but I wasn't 100% happy with the work. I'm still really close with those coworkers (one in particular has become a very good friend over the years! ), but I'm happier and more challenged in my current role. I've been in my current department for a little over 2 years now, and I've never regretted my decision to interview for that position! Thanks Kristen! Belize is amazing so I highly recommend making the trip happen. You won't regret it! Congratulations!! You had a great month with getting married and a new job and house! That's so exciting. I wake up at 5 and get home at 5, so I have a similar schedule x). It can poop me out, or at least make me want to veg out when I get home. I've said before, but girl you are KILLIN it in life lately!! So happy for you! !